I am so not a gardening expert. Let’s just get that out of the way right now. I had a garden about 5 years ago for one year, which I really enjoyed and learned a lot of lessons from. But since moving to another home I just haven’t done all the work to get it started. That’s all about to change though. I finally got my hiney in gear this week and decided to get my garden bed started, so that in the spring I can just plant and enjoy. Because really, the preparation is one of the hardest parts in my opinion! When I had my garden before (5 years ago) I lived in an area where my soil was pretty nice. Over there all I had to do was just add compost to the soil. I also just used a shovel to mix it thoroughly in to the soil (I was wishin’ so badly for a rototiller by the time I was done 4 hours later mixing with a shovel, but I was too cheap to rent one…). 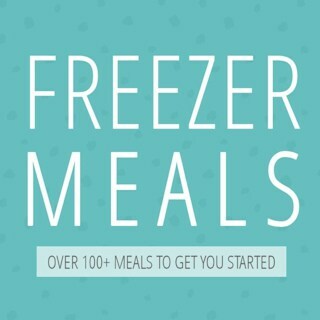 It’s no secret that I am a cheap skate – hellooo….couponer here! Now I live in Eastern WA and let’s just say my house is pretty much sitting on an old sand dune. Pure-dee sand. It was nice when we first moved in because my back yard was basically one giant sand box, and the kids LOVED it. I bought some shovels + buckets and it was bliss. But soil for gardening…not so great. 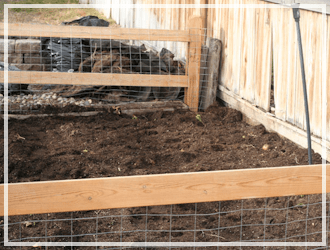 So I decided I wanted to do an above ground garden – aka a raised bed or box garden. Luckily for me there were some railroad ties wood left on our property so my husband cut it down so it would fit into a nice big square. We wanted to have another garden, but a few years have gone by and we haven’t done that final step which is adding the “good stuff” – or the good soil in. So here we are. Step one. Make a box, fill it with good soil. I really want to be successful at this so I wanted a fool proof plan. 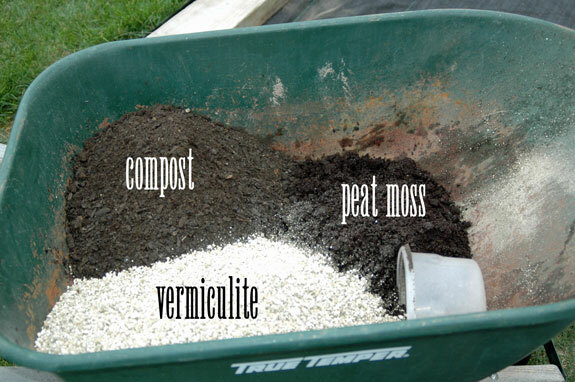 I was told by my gardening neighbor that using a great mix of Peat Moss, Compost and Vermiculite is the secret. If you have great soil to begin with it will be less expensive to just add great compost and mix it around, but like I said I am not messing around. I am using the secret formula for success. 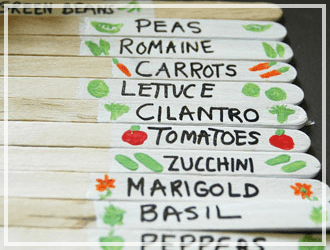 Dandee Designs shows you step by step how to make a raised garden box. The Coupon Project shows step by step how to make a really neat raised bed with PVC Pipes for covering if necessary. Genius! Frugal Living NW made a raised bed using wood and vinyl fencing materials. Here is my box, as is. Just sand and some grass clippings from our lawn mower blown in. I raked it level, finding a few sand box toys and a few of my nice spoons…(hiss). Next step was to add weed barrier stuff. 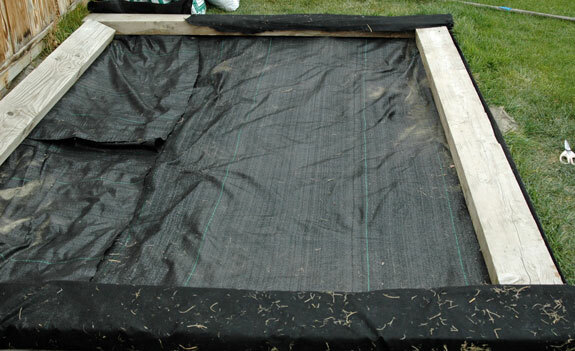 It cannot just be black tarp or something because you want your garden to be able to drain well, so weed barrier will keep the weeds out, but still the water can go through. I did mess up a little bit here. You should have enough to go all the way under your boards and over again (as you don’t want weeds to see any light or they will come a growing). I didn’t buy enough and ran out, but I refuse to go by more. Mine didn’t wrap totally around my boards all the way, but that’s okay. That stuff is not cheap! I think I paid $20 for just the weed barrier. (Sigh, will be worth it…I do hate weeds). 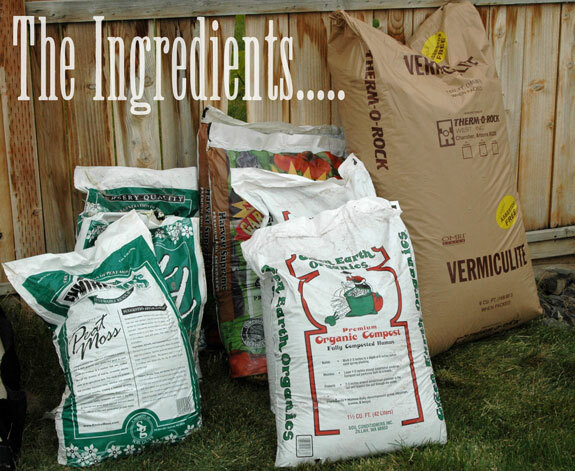 Once you have your base and your weed barrier down its time to make your PERFECT Garden Mix. 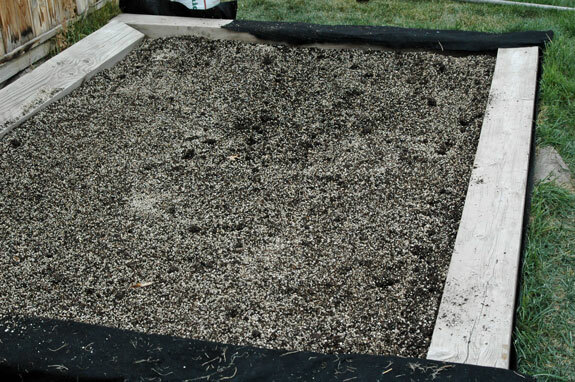 🙂 I was told the perfect raised bed garden soil mix is 1/3 part Compost, 1/3 part Peat Moss and 1/3 part Vermiculite. My green thumb neighbor said she used Chicken Compost and it was amazing, but that its also very strong and best to put out in the fall so you won’t burn your plants. Let it sit and become less potent over the fall. So Chicken Compost was my #1 choice since I am starting this fall, however they were all out at the nursery so I settled for Harvest Supreme Compost (which contains 15% chicken compost). I purchased all the necessary bags – Compost, Peat Moss and Vermiculite. Now to mix these you can lay out a tarp, add 1/3 of each to it and slosh it around a bit. 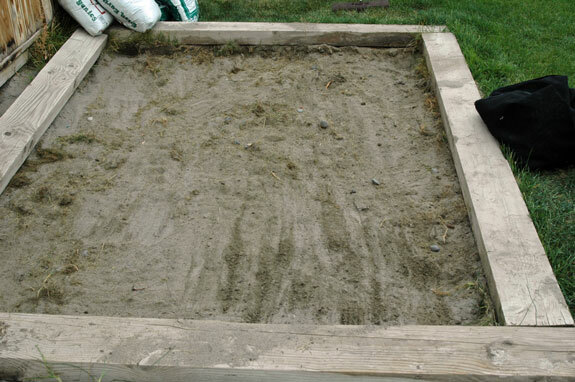 Then toss into your raised bed. But I just measured using a bucket into my wheelbarrow. 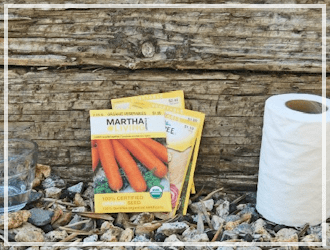 1/3 Compost – fairly inexpensive ($5.00-$9.00 per bag) or make your own! 1/3 Vermiculite (seriously…don’t know even what this is…but it is expensive!) $50 for a big bag. 1/3 Peat Moss – varies in price but I found some for $5.00 per bag. 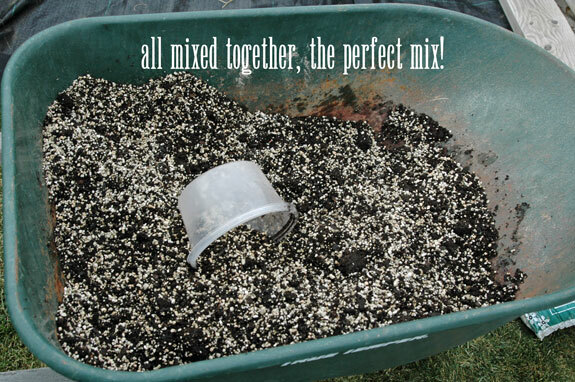 Add 1/3 of each into the wheelbarrow, mix it up and pour into the garden bed. I did this and then repeated this step until my garden was full! After some smoothing and staring at it admiringly for a bit I put my stuff away and smiled. It’s ready for the spring! Oh and one more thing, you don’t need to cover the garden or anything, just leave it open through the winter. It should be perfect and ready this spring for all the planting I want to do. Ooooh…so excited for Sweet Peas! What? Are you expert gardeners laughing at my little ole’ garden? Now, stop it! I worked really hard on this thing…yes it might not look perfect…..but its mine. 🙂 And it’s gonna bring forth much fruit, well hopefully. Is there anything I missed? Any super gardeners out there with any tips for me? Do you buy your seeds this time of year and stock up or do you wait till spring? Oh and one more question…is there anything I can plant now or do I need to wait until spring? 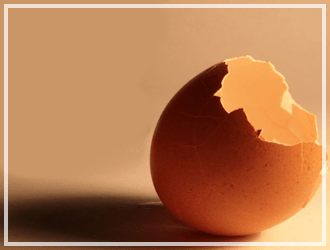 PS – This series to be continued in the spring…. If you want to see what happens what check out these posts! This actually has nothing to do with your gardening article but I couldn’t figure out how to contact you. I have just made your dishwashing tablets and they’re leaving a white fine powdering coat on my dishes. Any idea why ? Also what brand lemonade mix did you use ? my hubby is a farmer and some of the best “dirt” to grow plants in is sand. It just takes more tending as the water goes through it so fast. But he grows some HUGE potatoes in his sandy fields. There is a really informative book that you can probably get from your library called 60-Minute Vegetable Garden by Jeff Ball. There are a ton of useful ideas in this book for row coverings, trellises, companion planting and more. I would wait until after the first of the year to order seeds… just my preference. 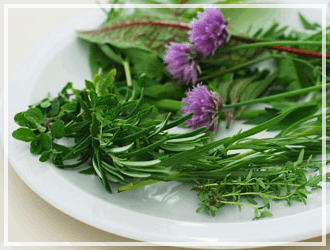 Try to pick plants that will give you the highest yield per sq. ft… things like beets as opposed to corn. When I first started gardening with raised beds, this was the book that I used and I’ve never regretted it. Thanks, I will check that one out, I appreciate it. Good job on taking the gardening plunge, and on preparing well in advance this fall! I was so excited about my 1st raised bed this year however, everything was eaten by earwigs. :o( I was so sad and I am not so excited about next year. (even though I dream of a flourishing raised bed!) 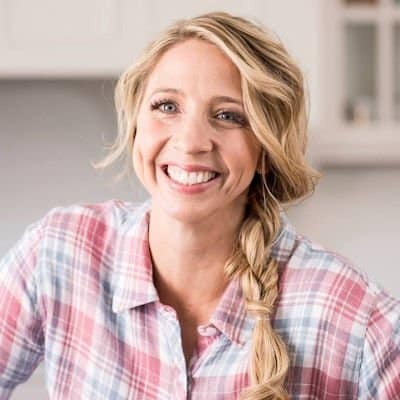 We tried beer, online homemade mixes and bug killers my husband would even go out after dark and kill 50-200 each night. Still everything was eaten up. Anyone else get eaten up? Any tips for earwigs? Thanks! Oh my goodness – I HATE Earwigs…yuck! Did you have bark in your mix, I have heard earwigs like bark? The vermiculite is the right amount for our climate here because it holds the moisture in and you don’t have to water…….as much! I did square foot gardening a few years ago with the same exact soil mixture and things grew LIKE CRAZY in the Tri-Cities! The only think we learned about making them grow was we needed to water TWICE a day in the heat of the summer or everything stays tiny. Once we figured that out it was like the garden of eden! And there were few, if any weeds because we made our own soil like you. BONUS! Have fun! Oh my goodness, getting more excited! Thanks for your tips, water twice a day in the hot summer days…check! Karrie, no, you don’t need to water the garlic at all this winter. Just put some mulch (leaves or grass clippings or some such) on it and let it go until next spring. Then you just water it through the summer until the tops start to turn brown. Once that happens, quit watering and wait for them to mature. Oh, and the tops of the garlic plants are edible (the part that curls and comes down-but cut off the bloom/tip). They taste similar to green beans with a creamy garlic-y taste. I like to fry them up with a little oil in a frying pan. Karrie, I have a couple questions for you. 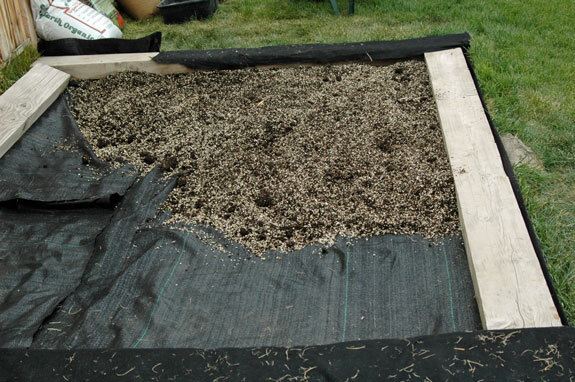 Your raised bed looks like it is even with the ground. Did you dig to get the railroad ties in the ground? And it doesn’t look like there is much soil on top of the weed barrier to plant the plants in in the spring. So are you going to cut the weed barrier so the roots can go deeper? Or don’t you have to? I am just wondering because I would like to try the raised beds. I have a regular type garden now and am ALWAYS weeding. And my soil is not that great either. My raised bed is even with the grass only because we put those railroad wood pieces out there before we did sod when we moved in. So it was set into place awhile ago before we added grass. If you already have grass most people just place it on top. As for the level of soil, I was told all you need is 4-6 inches of soil to plant any garden plants. (Which I thought was shallow as well, but I am assured that it will work.) I saw my neighbors garden and she grew the BIGGEST sunflower you have ever seen in just 6 inches of her raised bed, as well as tomatoes and zucchini. I think I will have to add more soil because I noticed it isn’t all the way up to the top. But hopefully I will never have to buy soil like this again, and I plan on trying to make a compost bin as well to supplement it myself. Yes, I am really looking forward to not having to weed too much with that weed barrier placed down. 🙂 Good luck if you do end up making the raised bed! Heidi, I made my raised beds with 1×6 cedar fence boards from Lowe’s. for each bed, I bought [email protected]′ and [email protected]′. I cut the 5′ ones to 4′ and used the cut off pieces to make triangular corner braces on the bottom to keep them square. I nailed a 5″ piece of 2×2 in each corner to have something a bit more substantial than the 3/4″ end of the fence board to make my corners with. Each bed only cost about $10 to assemble. And the beds are the perfect size…4′ width is ideal since I can easily reach the center from all sides. One of the things I like about my raised bed garden is that I don’t have to till. I never step on the soil and I’m even careful about pressing my hand down on it too much. It’s light and fluffy. I put much down in my pathways and do occasionally weed them! I get a few weeds in my beds all of the time from my compost but they are usually nasturtiums and I just transplant them. Any other weeds are simple to remove since my soil is so light. spend the time now to make your garden beds, like Karrie did. 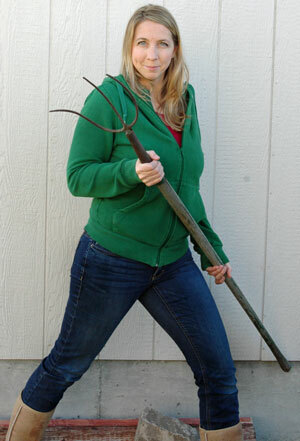 That way, when that soild warms up in the spring, you can be gardening instead of building or digging! karrie, EXCELLENT job on that sweet little garden! You will be amazed at how much you will be able to grow in it. My entire garden is raised beds filled with exactly that mix you made. And yikes! It is indeed expensive! But…I’m on my 3rd season with it and haven’t had to spend any more money on it since I put it in. I have a compost pile and I add that to the garden each spring to top off the beds. My one caution to you is that that lovely mix is going to compress a lot over the winter. you might need to add more since you will get the best results if you plant in at least 4 full inches of soil. That stuff is so light and fluffy and nutrient rich that I barely have to fertilize. (When I DO fertilize, I use compost tea. Ick!) I can even harvest potatoes with just my hands, if I want. Good job on the garden! NO garden is too small. I’M certainly not laughing at your efforts! Awwee, thanks Joni! You are so sweet! I have heard about marigolds as companion planting to keep away bad bugs…but had never heard about onions. I will for sure add some of those to the garden this spring, thanks for the tip! 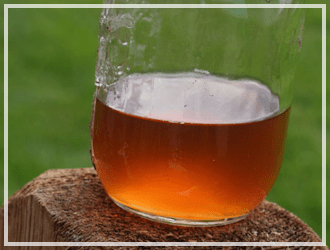 Compost tea is very easy, but icky, to make. I put a shovel full of compost in a 5 gallon bucket, fill it with water, cover it, and let it ‘steep’ for a few days. Then, using a large cup, I pour it on the my individual garden plants. I also use a lot of nasturtiums. They ‘draw’ the slugs away from my food plants and they make my garden SO pretty! I usually have a TON of seeds so just let me know if you want some. Yes—-plant garlic now, and spinach too! TIP–Look up vermiculite in Wikipedia. Pay close attention to what it says about asbestos contamination and health concerns. It is easy to make your own compost if you can get organic yard wastes– leaves, cut grass, etc.–even kitchen wastes like old lettuce, coffee grounds, peelings, fruit scraps. This will enhance that sandy soil. You can also find clay deposits locally. That would help too. Hi Chris, thank goodness my vermiculite bag said Asbestos free on it…whew! 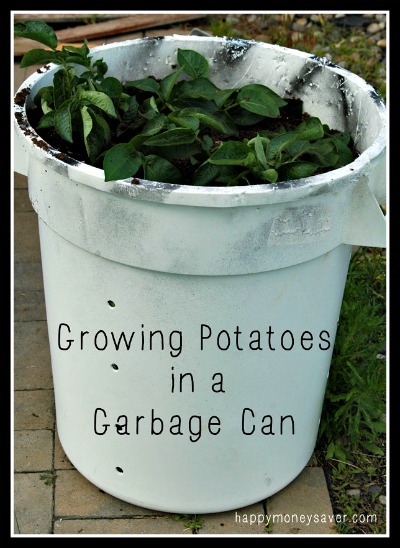 And yes I plan on trying to make my own compost bin this week, and hopefully by spring I will have a nice compost to add to the garden too. Thanks Myaela, I will try to add some garlic in there right now. Do I need to water it you think all winter long too?